Call Dr. Shoukas and schedule your complementary consult to determine whether you are a candidate for treatment with Dysport. Dr. Shoukas will ask you about your goals to determine where to administer Dysport. To do this he may examine your ability to move certain muscles in your problem areas. 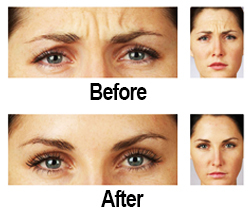 The location, size, and use of these muscles that create wrinkles can vary among individuals. The administration of Dysport involves no anesthesia. Dr. Shoukas may choose to numb the area with a cold pack or anesthetic cream. Discomfort is usually minimal and brief. Dr. Shoukas will administer a few tiny injections of Dysport directly into the muscles that cause those moderate-to-severe wrinkles. The entire treatment takes approximately 10 minutes and is done in our Lake Mary office. • No downtime is needed – you’re ready to get on with your day! Dr. Shoukas will give you specific aftercare instructions. Dr James Shoukas proudly serving patients in Lake Mary, Sanford, Longwood, Winter Park, Orlando and Daytona Beach areas.